With her red pill-box hat on her head, dark stockings & long eyelashes, TCR Ruby is one feminine looking cow! 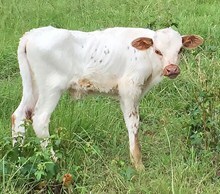 Sired by horn champion Big Wig, she's mostly white w/ dark spots on her neck & body. 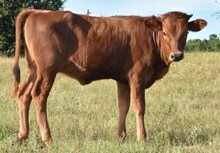 She continues to thrive in our pastures and is a ranch favorite. TCR Ruby won her age bracket at the ITLA Championship Show and Futurity in Oklahoma City in 2013 and 2014 and Houston Livestock Show & Rodeo 2015. She has an attractive color pattern, clean conformation and calm disposition. Her breeding includes Hunts Command Respect - twice, Top Caliber and Big Wig. All of these bulls are in the "Over 80" Club". Millennium Futurity eligible.